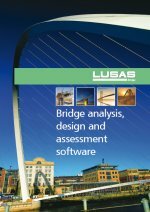 Unlike some structural analysis software selected LUSAS Bridge (and LUSAS Civil & Structural) software products, when used with appropriate nonlinear, dynamic and thermal/field software options, provide a range of soils-specific and general structural engineering analysis tools to enable finite element modelling of both ground and structure in a single model. Multiple analyses can be solved within each model, and state-of-the-art linear and quadratic element libraries; advanced material models; and linear and nonlinear joint models allow a range of soil-structure engineering problems to be solved. Useful geotechnical capabilities make use of a range of soil models. Residual soil stress varying with depth can be accommodated providing useful facilities for soil-structure interaction for integral bridges and culverts. Rock joints, pore water pressure dissipation, consolidation modelling, geotechnical problems involving long term excavation, construction in clays, and temporary works can all be solved. 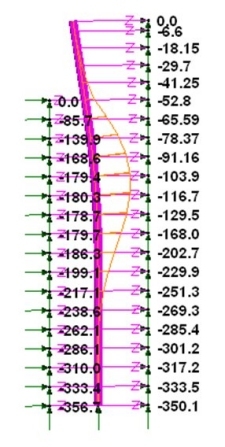 Calculate initial stress states providing K0 data and apply to any ground profile. Constitutive soils models include Tresca, Von Mises, Drucker Prager, Duncan-Chang, Mohr Coulomb, and Modified Cam Clay. Two-phase material properties can be added to selected materials to permit modelling the deformation of undrained/fully saturated and fully-drained/unsaturated porous media, and slow consolidation process. Draining and filling curves can also be specified for partially drained materials. Model the variation of soil properties with depth by defining soil profile variations, with LUSAS interpolating between defined locations. Nonlinear springs model active/passive soil joints. Interface meshes permit joining of the soil / structure. Gain / loss of contact, and skin friction can be considered. Specify a matrix of properties to represent a pilecap sitting on a group of piles in a 3D model. A Tri-linear (active/passive) earth pressure joint material wizard simplifies the modelling of a variety of soil-structure interaction problems, creating a piecewise linear joint material attribute with properties that vary with depth. Multiple attributes can be defined to represent layers of soil or changes in properties due to the presence of water. Construction sequence modelling - involving excavation / construction with insertion and removal of temporary members used for propping and jacking etc. Embankment /slope stability assessments and stability checks on adjacent structures due to temporary excavation. Backfilling of excavations and cut and cover tunnel structures. Settlement and consolidation including pore water pressure modelling. Dewatering and seepage modelling of partially saturated fluid flow through porous media, such as seepage of water through an earth dam, where the position of the phreatic surface is of interest. Modal and time history dynamics involving material damping, nonlinear behaviour, soil plasticity, boundary behaviour and springs/dampers. Soil-structure interaction analysis including vibration analysis from pile driving impact assessments on nearby buildings and response of buildings to emitted vibrations from rail tunnels. Any modelling and analysis capabilities described on this page are dependent upon the LUSAS software product and version in use. Last modified: July 10, 2018.